Dates of birth and death unknown. He was an actor in Kamigata from the 1680s and his stage name was Tsuyama Jihê. He became sakusha in 1694 and took the name of Tsuuchi Jihê I. He worked in the 7th lunar month of 1694 in Ôsaka on the drama "Nihon Ajase Taishi", which was produced by Iwai Hanshirô I and starred the Edo actor Bandô Matatarô I. He went to Edo in Fall 1700 with the actor Iwai Sagenta I. He worked in the 1st and 2nd lunar months of 1701 at the Ichimuraza on the dramas "Jitô Tennô Miyako Utsushi" (1st lunar month) and "Keisei Uba Zakura" (2nd lunar month). No record afterwards. He was the founder of the Tsuuchi clan. He was also the father of Tsuuchi Jihê II and the master of Tsuuchi Kuheiji I. The sakusha Tsuuchi Eishi I held the name of Tsuuchi Jihê II from 1704 to the 10th lunar month of 1753. The sakusha Dontsû Yosabê I held the name of Tsuuchi Jihê III from the 11th lunar month of 1762 to the 10th lunar month of 1765. Dates of birth and death unknown. Disciple of Tsuuchi Jihê III, his first pen name was Tsuuchi Kumazô. He took the name of Tsuuchi Jihê IV in the 11th lunar month of 1828, working at the Kawarasakiza, along with Mimasuya Nisôji and Shinoda Kinji II, on the kaomise drama "Sakigake Genji no Kibamusha", which welcomed in Edo the actors Sawamura Gennosuke II, Arashi Danpachi and Yoshizawa Enjirô. Jihê's yearly salary was 40 ryô . He took the name of Dontsû Yosabê II in the 11th lunar month of 1836, working at the Nakamuraza, along with Sakurada Jisuke III and Matsushima Chôfu II, on the kaomise drama "Shindô Saemon Tsukushi no Kumiobi". 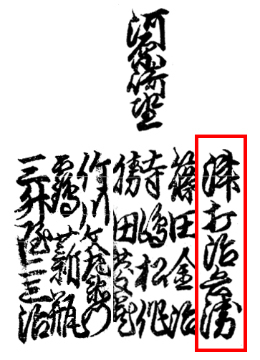 He took back the name of Tsuuchi Jihê IV in 1840. No record afterwards. The 19th day of the 4th lunar month of the 8th year of the Meiwa era was the 1st of June 1771 in the western calendar. Tsuruya Nanboku IV, the best Edo playwright, was paid 175 ryô. Ichikawa Danjûrô VII, the zagashira at the Kawarasakiza, was paid 700 ryô.